None will be happier when spring comes than the beleaguered residents of the central and eastern United States. There are various definitions of exactly when this actually happens. Meteorologists, astronomers, solarians, and Punxsutawney Phil all have their own definitions of spring; I’d like to suggest one more. Meteorologists are normally precise people. So it may be a surprise that they have used a very crude approximation to define spring: the three calendar months that come between the three coldest calendar months and the three warmest. As we’ll see, they could have been very precise, but precision sometimes introduces complications. At any rate, March, April, and May comprise the meteorological spring, which has already sprung. Equinox and solstice. Illustration courtesy of NOAA. Astronomical spring is the period between the vernal equinox and the summer solstice. It is a definition with great precision, but that is about all it has going for it. This year, astronomical spring will begin, to the nearest minute, on March 20 at 12:57 p.m. Eastern Daylight Savings Time (16:57 Universal Time), at the moment when the sun is directly over the equator. Though astronomical spring is precisely defined, the vernal equinox does not occur at the same time every year. 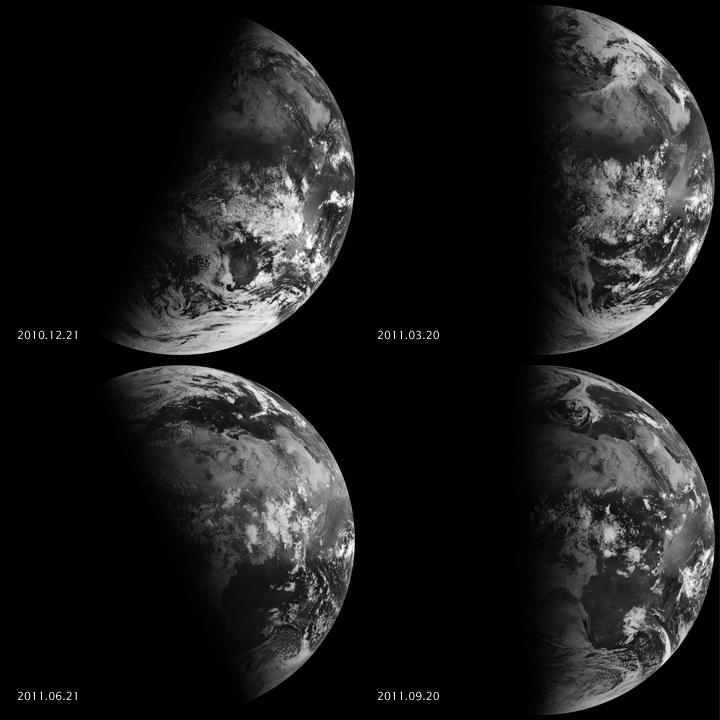 In 2015, the vernal equinox will be at 22:45 Universal time. This apparent tardiness on the part of the sun requires an adjustment every so often — we make this adjustment by including an extra day in February every four years; that’s the Leap Year. Solar spring is the three calendar months with the fewest hours of daylight. Since the shortest day is Dec. 21, these three months are November, December, and January. Solar spring begins on February first; ’nuff said about that. The most famous resident rodent of Pennsylvania comes out to check the weather on Feb. 2. This year it was raining, but because he was confused by the commotion about the Super Bowl, Phil thought he saw his shadow and crawled back in his hole, signaling another six weeks of winter. The seasons look a little different every year. Image courtesy of NASA. That would put the beginning of spring on March 16, 2014, which is interesting because it coincides with the actual date when the day and night are equal (varies a little with latitude), and that is what equinox (Latin for ‘equal night’) is supposed to mean. The reason for the discrepancy between the date of the vernal equinox and the actual date of ‘equal night’ is the width of the sun and the definition of sunrise and sunset. The former occurs when the sun’s first rays appear and the latter is when the last ray is gone. It takes about four minutes for the full disc of the sun to cross the horizon. Everyone agrees that spring comes between winter and summer. Everyone also agrees that winter comprises the three coldest months and summer the three warmest. In the True Seasons (TS) system, we find the 91 coldest days — that’s winter; spring begins the next day. Ditto for summer (the 91 hottest days) and the first day of fall. There are two possible objections to the TS definition. First, the date varies from location to location: March 10 in New York and March 3 in Chicago, for example. In Dallas, Texas, the date is Feb. 24. Second, the length of spring and fall may not be equal. In Dallas, spring would last 106 days and fall only 76 days. Though standardization is the order of the day in the modern world, there are precedents for allowing seasonal occurrences to vary: Indian summer is a warm spell after the first freeze; and many religious observances are connected to moving dates. Easter is the Sunday after the first full moon following the vernal equinox; the date can vary by nearly a month. Months, themselves, have different numbers of days. The proposed True Seasons definitions of winter as the 91 coldest days, summer the 91 warmest, and spring and fall the periods in-between will be brought up at the next meeting of the Association of Dedicated Scientists (ADS), and should soon be the generally accepted definitions. In the meantime, enjoy the spring weather whenever it comes. I am glad you finally, at the end of your article, talk about seasons in terms of days, not months. In my opinion defining seasons in terms of months is neither accurate nor useful except for rules of thumb for people who don’t much care. Not ’nuff said. Solar WINTER is the three calendar months with the fewest hours of daylight. Since the shortest day is Dec. 21, these three months are November, December, and January. Solar spring begins on February first; ’nuff said about that. Solar winter is the period (days, quarter of the year, whatever) with the fewest hours of daylight, and is centere on the shortest day which is Dec. 21. Solar spring begins on Feb. 2. and is centered on the equinox in or around March 21.